VFL: Round six win in 60 seconds Watch highlights from Collingwood's 20-point win over Geelong in round six of the VFL. James Aish was named among Collingwood's best players in Saturday's 20-point win over Geelong at Simonds Stadium. A trip down the highway to play at Simonds Stadium is a daunting task for most opposing teams. However when the VFL Magpies take the field at the Cattery, they've taken to impressing and throwing a surprise those watching. A round six clash against Geelong on a sunny Saturday afternoon was no exception. The Pies kicked early goals before holding the momentum of the Cats at bay to win 8.16 (64) to 6.8 (44). “It’s a bit like a second home ground,” coach Dale Tapping told Collingwood Media post game. “We’ve played a lot of footy here over the last couple of years. “Our record from a VFL standpoint has been pretty good down here… it’s a great venue. Consistency has been hard to come by for Collingwood’s VFL team this season. The Magpies have won three games in 2016, but are yet to string together back-to-back victories. However, as evident on Saturday, the Pies’ desire to bounce back from defeat is strong. From two early Ben Moloney goals in the first quarter, the pressure being placed on the Cats was clear. Jordan Collopy and 23rd man Dale Hinkley added two more to give Tapping’s side an 18-point lead at quarter time. While the attacking was fierce, the coach was more encouraged by what happened at the other end of the ground. Geelong kicked with a strong breeze towards the Players Stand end of the ground in the second quarter. Their forward half of the ground was frequently busy, yet the Magpies defence stood up time and time again. Jordan Kelly marked well in what was his third consecutive game as one of Collingwood’s best players. Not far behind him was Jonathon Marsh, while Ryan Pendlebury also impressed in his first game of the season. Defender Jonathon Marsh takes a breather on the bench in the final term. “There was some challenges around the conditions. (The biggest strength) was our ability to adapt,” Tapping said. Just as was the case for the Magpies in the second quarter, Geelong failed to kick a goal at the Gary Ablett Terrace end after half time. 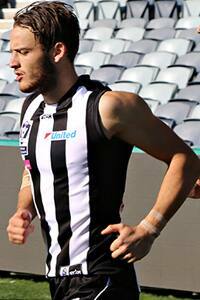 After being dropped from Collingwood’s AFL side, James Aish played his best quarter of football in what was overall an impressive return performance. “Aishy had a role to play for the team and I thought his attack on the footy was really good,” Tapping said. From Jarrod Witts to Brent Macaffer to Travis Cloke, Tapping described the presence of Collingwood’s senior AFL players as “really positive”. Travis Cloke chats with teammate Jordan Collopy in the rooms post-win. The coach singled out youngster Brayden Sier for a performance he believed showed improvement. “We saw some growth out of Brayden today,” Tapping said. From their home away from home, the VFL Magpies will return to their new home at the Holden Centre next weekend when they take on Williamstown. Tapping says his side will continue to “fight the fight” as it looks to win consecutive games for the first time this season.